Sunseeker is to add 80ft (24.9m) and 101ft (29.8m) Sport Yachts to their range, to complement their existing Sport Yachts. 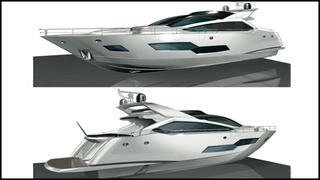 Due to launch in the summer of 2013, these two boats slot into the Sport Yacht range below the 115 and 130. The 101 eschews the current trend for raised pilothouse designs at this length and puts the saloon, dining area and helm all on the main deck, with a full-width master suite aft on the accommodation deck, with two midships double cabins and a VIP cabin forward. The 80 follows a similar design and layout, but on a slightly smaller scale.